Acute otitis media (AOM) should remain an entirely visual diagnosis for all of us. A much-improved guideline on the diagnosis and management of AOM was recently published in Pediatrics.1 The new diagnostic emphasis in AOM is now the presence of infected middle ear effusion (MEE), as it appears with different levels of a bulging or convex tympanic membrane (TM). In the guidelines, the child with moderate to severe bulging TM or otorrhea is definitely considered to have AOM, whereas the child with mild bulging TM (once termed “fullness”) should also have concomitant recent ear pain or intense TM erythema. Remember that straight-forward otitis media with effusion, or serous otitis, should not be treated with antibiotics, but rather followed up over several months. As every pediatrician is keenly aware, AOM is the most common reason for prescribing antibiotics in every general clinical practice. In fact, before routine PCV7/13 vaccination, an AOM episode developed in 94% of all children in a non-inner city population by the age of 24 months.2 So, one would assume that probably the most important aspect in the entire discussion of AOM and its treatment would be how to correctly diagnose AOM and the optimal methods needed to obtain its diagnosis; however, one would be mistaken. Shaikh and Hoberman3 briefly addressed this problem in 2010. We are all painfully aware of how poorly diagnosed or misdiagnosed AOM can often be. Just ask any otolaryngologist or general pediatrician who sees patients in follow-up from many of their own less-experienced health providers, community emergency rooms, urgent care centers, and even from other too-busy pediatric offices. Unfortunately, for such an everyday problem, the amount of time spent on teaching the correct diagnoses and management of AOM in medical school is negligible. Even in most pediatric and family practice training programs, training is minimal. So, why do we give such short shrift to such an important, ubiquitous pediatric assessment that must be ascertained in nearly every young pediatric patient’s well or sick visit? Do not kid yourself; this is one of the most technically difficult tasks to perform on young children within a general pediatric practice. It requires a confident, firm parent to restrain the child, as well as your own extreme diligence, patience, a lot of upper arm strength, and a stable eye to perform this task in most children younger than 24 months and in many children up to 4 years old. To compound the technical difficulties, the TMs in nearly 80% of children under age 12 months are partially or totally obscured by wax.4 You may never adequately see the TMs in most of these children without some manner of cleaning the debris from the ear canals. Thus, it can often take a great deal of extra time and effort to obtain the correct diagnosis — hard to do in busy office practice! Too much feistiness and pushback from the child toward either the parent or the pediatrician. Poor practitioner training in assessment of TM markers of bona fide AOM. The remainder of this article addresses each of these issues from my point of view as a U.S. Food and Drug Administration preferred clinical investigator of AOM. I have previously written many treatises on the management of AOM, most recently touching on the diagnosis of AOM in the neonate in the June 2012 issue of Pediatric Annals5 and in the third edition of our book, Diagnosis and Management of Acute Otitis Media.4 For the last 31 years, I have examined bilateral TMs in more than 3,000 patients annually, performed tympanocentesis in more than 400 patients with severe AOM, and been a principal investigator in nearly 50 clinical trials involving AOM and approximately 10 clinical trials involving TM instrumentation. One of the most important and most overlooked areas of assessing the TM is the use of optimal instruments. Figures 1A and 1B display the primary options for otoscopes: the Welch-Allyn MacroView and the standard head. I much prefer the new version MacroView because of its crisper optics and longer-lasting, brighter lithium battery. It is worth the price differential. Just be sure to line up or adjust the green line according to your own visual needs. Welch-Allyn otoscopic heads and a handle. (A) This is the “Macroview” (preferred). (B) This is the less expensive “standard” otoscopic head. (C) This is the Welch-Allyn “surgical” head with green round speculum. (D) Otoscopic handle (top): the lithium ion battery (preferred); otoscopic handle (bottom): the nickel cadmium battery — just not as bright or long lasting, and as the battery wears, the light becomes subtly and almost imperceptibly duller for quite awhile. I cannot emphasize enough the critical importance of using the original non-disposable specula as shown in Figure 2 for all children younger than age 4 years.6 These specula are longer in order to get past the bend of the ear canal, more tapered, have a critically wider aperture, and reflect light better from the plastic onto the TM. You will need to wipe them down with an alcohol pad after each visit, and they sometimes require cleaning of the aperture with a cotton swab. The little bit of extra effort is well worth it, as the shorter, stubbier disposable specula are simply inadequate assess for younger children. 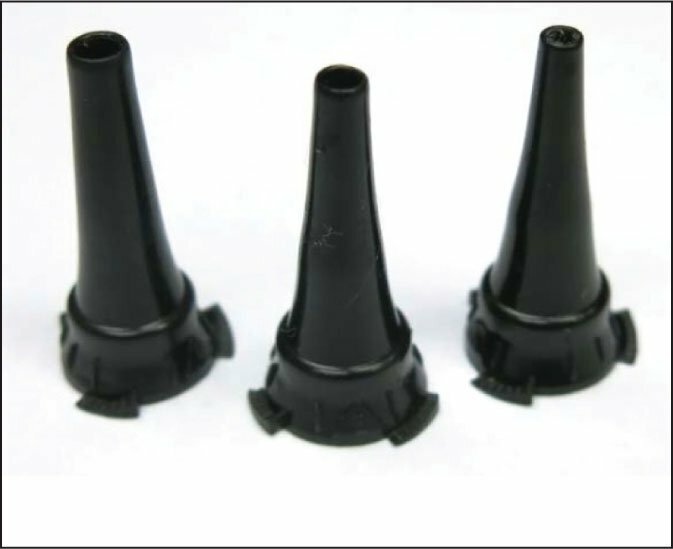 Original manufacturer non-disposable specula: 4-mm, 3-mm, and 2.5-mm sizes. Better for children younger than 4 years old, these longer more tapered specula are highly preferred over the shorter stubbier disposable 2.5-mm speculum. Occasionally, you may encounter a child with such tiny ear canals that they may preclude the entrance of even the 2.5-mm speculum. Some may even have atretic canals, and you will need to consider otolaryngology referral and probably a CT scan of the middle ear space to see if any functional TM remains. For the rest of these rarely encountered patients, the Welch-Allyn surgical otoscopic head and its 2-mm green speculum (Figure 1C) will frequently allow you to visualize the TM until it enlarges enough for the routine otoscope as the child matures over time. You will often encounter children with significant amounts of cerumen obstructing the ear canal, challenging your adequate visualization of the TM. It is important to make sure that the debris is not pus and/or blood from otorrhea. Cleaning the cerumen ear canals is the bane of pediatrics, without a doubt. You will need one or several of the curettes shown in Figure 3. Personally, I prefer the stiffer metal curettes like the dark-handled one shown in Figure 3B, but it can pose the potential hazard of scratching the canal and causing subsequent secondary brief bleeding; however, this can be tamponaded with a portion of cotton ball. 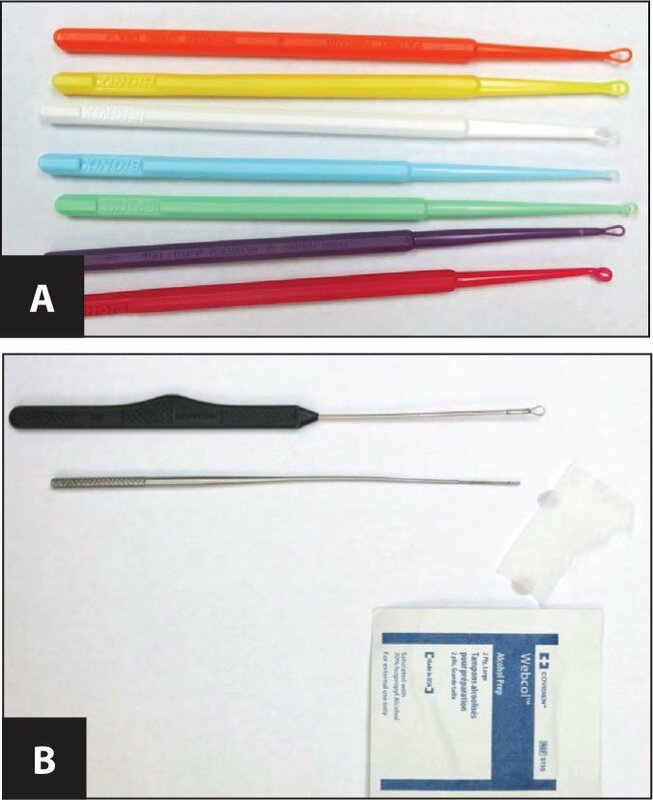 (A) Assortment of tympanic membrane curettes: colored curettes (Bionix Medical Technologies) are plastic and more bendable, and preferred by the less experienced otoscopists due to its lower likelihood of scratching the canal. (B) The larger, black-handled curette is metal, and is preferred by many experienced otoscopists; the bottom “Farrell” curette should only be used along with a wrap-around corner of a piece of alcohol swab to “wet mop” the remaining softer debris in the ear canal. The key is the gentle but firm restraint of the child by the parent or, rarely, by your nurse. When cleaning ear canals in infants or obstreperous young children, I now always use the technique of laterally positioning the child upon the exam table with the parent firmly restraining the arms while lying on the lower trunk and legs; I can then restrain the head with one hand. The cleaning often takes up to a few minutes, as well as patience and gentle strength on the part of the physician, as most of us know. This positioning technique especially pays off in children aged younger than 6 months. The less we aggravate the child, the easier the exam will usually be the next time. 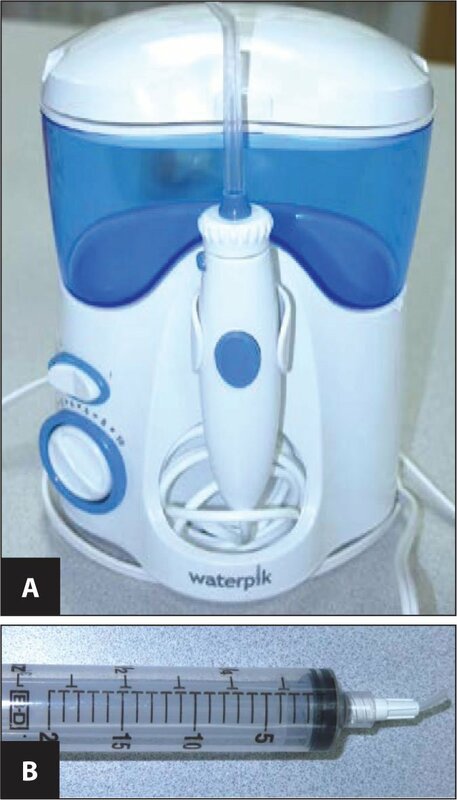 For those children who are too difficult or too compacted with cerumen, ancillary personnel are needed when resorting to the instruments shown in Figure 4; however, make sure the child does not have a history of recent PE tubes or TM perforation. Our techs pre-soften the cerumen by instilling several drops of peroxide for about 5 minutes. Often, young children can merely sit on a parent’s lap during the process of gentle irrigation until the tech perceives that the wax has been flushed into the irrigation basin. The tech has to be keenly aware, however, and stop if the child seems to really be in pain — not just fussing — during the flushing process, as very rarely, a hidden perforation or patent tube may be present. Two instruments for flushing the cerumen filled canal. (A) Waterpik [Water Pik, Inc.] electric device. Bottom: 20-cc, hand-held manual-pump 20 cc syringe with a cut-off, large-bore plastic IV catheter. This is truly the art of pediatrics. You must decide how much restraint, pressure, and calm reassurance to administer to each child. My preference for most “non-ballistic” children aged older than 6 months is to allow them to sit comfortably sideways on the parent’s lap while I firmly press the child’s head against the parent’s chest. You should tell the parent to sit firmly back against the chair, to keep the child’s feet hanging off the chair or his or her leg, and to not be alarmed by the child’s likely resistance. You should not “box” the ear, but rather use the gentle force of your thumb against the pinna and the child’s skull to apply mild upward traction. Novices also tend to force the speculum too far into the canal, when it often only requires inserting a few millimeters or so. Being gentle but firm must be finessed. A minimally traumatic experience will often pay off, with quicker and more compliant future examinations of all body parts. Fortunately, the 2013 AAP guidelines on AOM now emphasize the diagnostic importance of purulent or cloudy middle ear effusion (MEE), along with severe redness or new-onset otorrhea. Symptoms plus a non-purulent MEE are no longer considered evidence for the diagnosis of AOM. AOM symptoms in young children “are mostly non-specific, variable, and not infrequently absent.”7 The current AOM definition is now mostly synchronous with my previous delineations of AOM diagnosis over the last decade (Table 1). However, according to the AAP guidelines, presence of significant fever (102.2° F) or significant ear complaints will place the child into different categories of AOM severity, which will have implications as to how to approach antibiotic therapy. Most pediatricians in practice can readily ascertain fullness or bulging of the TM within a clear ear canal. It is this positive pressure upon the TM that foremost assures the diagnosis of AOM, even as espoused by the new AOM guidelines. Interestingly, the “true” mobility of the TM (a very difficult process for most of us to determine) or ascertaining the severity of otalgia rarely ever changes the diagnosis of AOM, as shown by the data from Shaikh et al.9 Seven U.S. experts in AOM assessed 945 middle ear images; out of all AOM cases, bulging TM and marked redness alone was present in 93% and 2%, respectively. Otherwise, knowing the presence or absence of TM mobility altered their diagnosis of AOM in only three of 945 TM evaluations. Of these three cases, one each was changed from AOM to OME (otitis media with effusion), one from AOM to normal, and one from normal to AOM. Furthermore, knowing the presence or absence of “otalgia” changed the diagnosis of OME to AOM in seven (10%) of otalgia cases, and from AOM to OME in seven (0.8%) of non-otalgia cases. For those who wish to pursue TM mobility, one primary and two ancillary instruments are available, as shown in Figure 5. Note that each of these instruments requires a fairly clean ear canal. The latter two are also not likely to be very reliable in children aged younger than 6 months due to the elasticity and tininess of the ear canal in this age group. (A) Hand-held otoscopic insufflator to help determine tympanic membrane (TM) mobility when using the otoscope. (B) Tympanometry machine for detecting middle ear fluid and mobility by the curve’s appearance, as well as patency of pressure equalization tubes or presence of a TM perforation by the volume reading of the entire ear canal space versus the entire middle ear. (C) Close-up of the schematic of potential readings and their interpretation. A printout of the TM findings is available. (D). EarCheck device (Innnovia Medical), or spectral gradient acoustic reflectometry, for consumer use. Among other things, the professional, more advanced EarCheck Pro device (not shown) provides an additional feature of a printout of the TM findings. The simplest and cheapest method is to use the handheld insufflator shown in Figure 5A. However, this inexpensive auxiliary otoscope part also requires much bimanual dexterity, as well as the sufficient restraint of the child for a period of several “eternal” arduous seconds. This time may be better spent in pursuing the accurate position and color of the TM in the often unruly child. Also, if you are not careful, this blowing process and “jamming” the speculum into the canal to create a seal can be quite uncomfortable for the child, thus jeopardizing future cooperation with this and other simple examinations. The best way to learn about the defining characteristics of AOM versus OME versus normal is to examine a plethora of variations on TM findings with oversight from a qualified mentor. An excellent initiation and training CME program for differentiation of the TM findings has been developed by the otolaryngology experts at the University of Pittsburgh. The website is located at www.pedsed.pitt.edu under subheading: Enhancing proficiency in otitis media (eprom). The diagnosis of normal TM and bulging TM is relatively straight-forward, as seen in the first three middle ear samples (Figure 6). However, it is those TMs with more subtle findings, as shown in the remainder of TM photos, that create the diagnostic dilemma for all of us in pediatrics. My evaluations for each of these TMs were corroborated by and totally harmonious with each of my three astute, highly experienced otoscopist general pediatric partners, James Hedrick, MD, Ron Tyler, MD, and Dan Finn, MD. Obvious diagnostic tympanic membrane (TM) findings regardless of TM mobility and patient symptoms. (A) and (B) Examples of bulging, infected TM. (C) An example of a normal TM. In the group of TMs in Figure 7, the TM photographs in A to E were each considered by us to be definitive cases of OME, and therefore not treated with antibiotics. Photographs F and G were considered as cases of OME with early superimposed infection due to the “fullness” in F, and the notable hyperemia and fullness of the pars flaccida in G. Thus, we would prescribe antibiotics for them. The subtler and more difficult diagnostic tympanic membrane (TM) findings, regardless of TM mobility or patient symptoms. Each one has an element of middle ear effusion: infected/treatment-worthy or not? Images courtesy of Alejandro Hoberman, MD. Each of the TMs in Figure 8 was considered to have a purulent air-fluid level and, therefore, we would treat them, if they initially presented with significant symptoms of URI, fever, or fussiness. Over the decades, having performed tympanocentesis in numerous similar-appearing, mildly infected TMs (simultaneous with a contralateral bulging TM) as those in Figure 8, we nearly always observed the recovery of an identical bacterial pathogen from both ears. However, we would also not treat any asymptomatic children in Figures 8C, 8D, and 8F if they had recently finished antibiotics within the last few weeks. We readily acknowledge both the common persistence of some MEE after an episode of AOM and the “post-antibiotic effect” or persistent low-level antibiotic concentrations after a recent course of antibiotics. Because of the fullness or mild bulging that we perceived in Figures 8A, 8B, and 8E, we would proceed with further antibiotic therapy. Only one of us thought that the findings on insufflation of these particular TMs would possibly change our mind. The subtler and more difficult diagnostic tympanic membrane (TM) findings, regardless of TM mobility or patient symptoms. Each one has an element of purulent middle ear effusion: infected/treatment-worthy or not? With all due respect to the AAP 2013 guidelines, the concept of “otalgia” and “ear tugging” or direct ear pain is much too infrequently observed, too vague, too non-specific, and too unreliable to be of much use in the infant or child aged younger than 36 months.12 And far too many young children with normal TMs constantly tug at their ears during any illness. 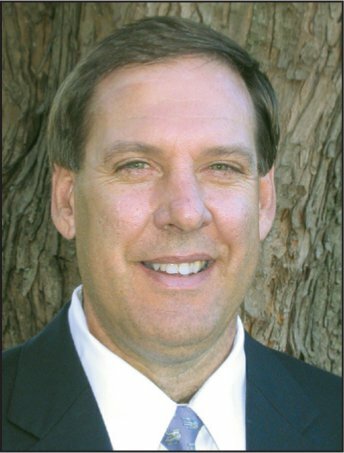 The diagnosis of AOM continues to remain almost exclusively “what you see, not what you hear.” New, improved 2013 AAP guidelines for management of AOM have refined the physical diagnostic criteria for AOM without providing many specifics about diagnostic techniques. Practitioners need to use the optimal instruments and approaches, particularly in infants and younger children, when attempting to differentiate AOM from OME and normal. With all the physical and time obstacles, as well as the major difficulties encountered while examining TMs of young children, I recommend a simplified and quick approach using my three criteria for the diagnosis of AOM: position, opacification, and discoloration. The plethora of subtle variations in TM findings when MEE is present will continue to challenge the diagnostic skills of every otoscopist, as well. Block S, Harrison CJ. Diagnosis and Management of Acute Otitis Media. Third edition. Caddo, OK: Professional Publications, Inc. 2005. Block SLDiagnosing acute otitis media: it’s what you see, not what you hear. Postgrad Med. 2005;118(6 Supplement Emerging);32–33, 5–12. Laine MK, Tähtinen PA, Helenius KK, Luoto R, Ruohola A. Acoustic reflectometry in discrimination of otoscopic diagnoses in young ambulatory children. Pediatr Infect Dis J. 2012;31(10):1007–1011. Discoloration Mostly or entirely cloudy / purulent (green, pale yellow or non-scarring white fluid) or marked hyperemia indicates AOM vs. gray (normal) or amber / orange (OME).